Call AusStyle Metal Roofing for a free assessment on 0412 481 993. What profile sheet should I use on my roof? Designs of roofs differ from house to house and you and/or your roofer will need to choose the appropriate profile sheets for the pitch and design of your homes roof. There are many different roof sheet profiles and each one has a specific function as well as how it looks. AusStyle Roofing recommend the Colorbond range of roofing products, built for Australian conditions, built to last. The 3 most common profiles used in domestic housing are Custom Orb, Trimdek & Kliplok sheets. Custom Orb roof sheets are probably the most common profile used on domestic housing and when most people think of Colorbond roofing, they think of this corrugated profile. Although it is very popular, it is not suitable for all kind of roofs and to be warranted by Bluescope Steel, its application needs to meet certain standards. Depending on the BMT of the sheets used, there are specific batten spacing requirements. Trimdek roofing has bold trapezoidal ribs and subtle fluting in the pans and is fixed with screws. This profile of roof sheeting is for roofs with a pitch of 2 degrees and above. Kliplok roof sheets have a stong rib rising from flat pans with longitudinal fluting, offering long, straight lines for a crisp and clean finish. 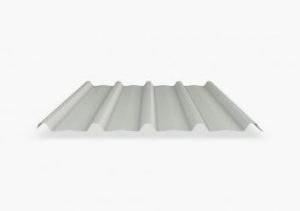 This profile sheet is suitable for roofs with a pitch of over 1 degree and is fastened using concealed klips and is ideal for those flat roofs. It also allows for wider batten spacing. What is the difference between 0.42bmt and 0.48bmt sheets? 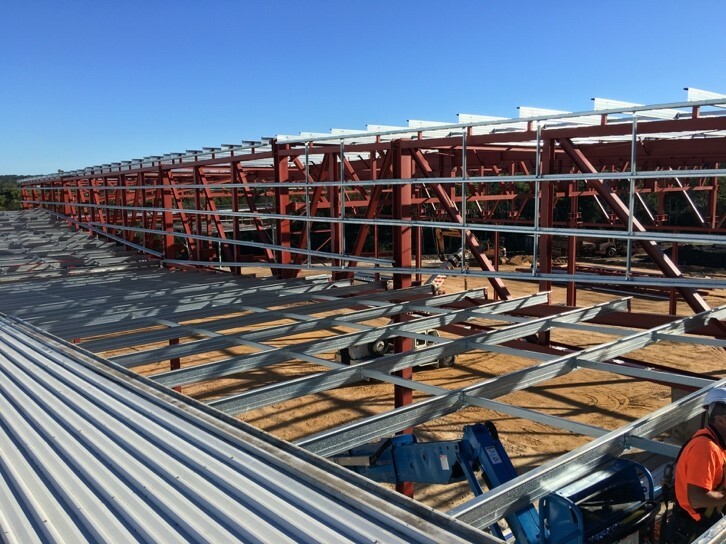 Colorbond steel roof sheets come in various thickness’ and this will be referred to as its base metal thickness (BMT), which measures the thickness of the raw steel. Thickness of sheets range from 0.42bmt to 0.80bmt. The BMT rating of the sheet is important as it dictates the spans that can be used for support. The higher the BMT, the larger the span between the roofs supports. The higher BMT is stronger and less easily dented or fractured, especially when people are accessing the roof to clean gutters and perform maintenance, eg. flue cleaning, aerials etc. The 2 most commonly used BMT’s for domestic roofing are the 0.42bmt and the 0.48bmt sheets. The 0.42bmt sheets are the base range thickness and the 0.48bmt sheets are a step up from this. AusStyle Roofing recommends the use of 0.48bmt Colorbond sheets as they have superior strength compared to the 0.42bmt and are only a fraction more expensive than the 0.42bmt sheets. The 0.48bmt sheets are better value for your money when compared against the 0.42bmt, especially if your roof is accessed frequently or subject to tree branches/debris falling onto it and it will have a longer life span. No matter what BMT you choose, make sure it is the appropriate product for the batten spacing’s, if the wrong product is used it will jeopardise your roof sheets warranty! Do I need a new roof and what is involved with re-roofing my house? As tile roofs age, they can develop a multitude of issues. The mortar/pointing work breaks down meaning the ridge caps can become loose, letting moisture in and possibly the displacement of the cap in high winds. The tiles become brittle and porous as the glazing has been worn off over many years, making the tile easy to break and also tiles will now start to absorb water instead of repelling it, allowing water to enter the roof cavity – the beginning of water damage internally. Valleys rust over time and roof flashings start to break down. At this point re-roofing becomes the best option and its better to do it sooner rather than later, keeping water damage to a minimum. Colorbond metal sheeting has become the most popular choice today for home owners when re-roofing their home. It’s aesthetic appeal, various design capabilities and incredible durability, along with its minimal need for maintenance has made it the product of choice for new, existing and commercial roofing projects. Colorbond roofs are lightweight, exceptionally resistant to extreme weather events, thermally more efficient than tiles and are less of a security risk, as it is difficult to open a section of the roof without the proper tools. 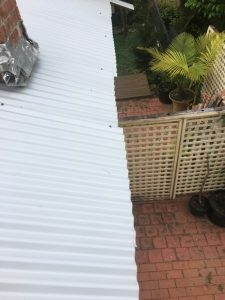 The concept of metal re-roofing is quite straightforward, re-roofing involves the removal of the current roofing material and then the installation of a new metal roof to the existing roof frame. Based on a careful inspection and evaluation of your roofing needs, AusStyle Metal Roofing will provide you with a detailed plan on how to proceed. In most cases, this will involve stripping down a large part or all of the elements that make up your current roof and replacing them with new materials and framing, or even a completely new roofing system with an entirely different structure. Many people don’t understand the importance of all the steps involved and end up trying to cut costs on their re-roofing project. However, not hiring a licensed, knowledgeable roofing expert can lead to delays, huge expenses and sometimes even the entire job having to be redone completely. The installation of the new roofing system and final clean up. 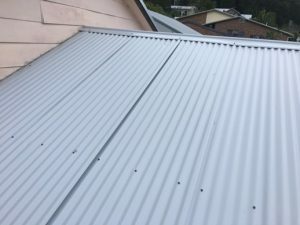 Next, AusStyle Metal Roofing will analyse the data and come up with an accurate estimate, while giving you recommendations so you can make an informed choice in regards to materials and features to be used. It is extremely important that you clearly communicate with us at AusStyle Metal Roofing exactly what you want from your new roofing system. Initial preparation involves using proper safety precautions and thoroughly clearing and cleaning the area to facilitate the creation of an ideal work environment. The AusStyle Metal Roofing team will start stripping away existing tiles and metal flashings around vents, chimneys and valleys in the roof, ultimately removing the old roof in its entirety to make way for the new installation. In the process, the structure of the roof is carefully inspected, and any water damage or rotten roof battens are replaced. Occasionally, when installing new metal roofing, batten measurements have to be taken, and the old battens need to be replaced with steel roof battens to comply with building codes and manufacturer specifications. 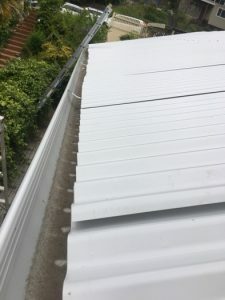 In some cases, before adding the flashing and finishing the job, the AusStyle Metal Roofers may also install additional profile infill using silicone adhesive. This will provide improved durability, waterproofing and insulation in the long run. Finally, re-roofing can be quite a messy job. At AusStyle Metal Roofing we pride ourselves on not only delivering an awesome new roof but ensure you do not have to lift a finger as we make sure the site is cleaned to the highest of standards. Sit back, relax and enjoy your new roof with the knowledge that when the next big rains come, you will have a great, stress free sleep! This is a common question and fundamentally depends on two factors: How bad the existing roof is and your budget. The only way to know how bad the roof really is, is to get a un-biased professional opinion. One important thing to remember is: The longer you leave it, the more likely it is that water will get into places it shouldn’t and cause internal damage that can go unnoticed to the resident until its too late! Another important thing to take into consideration is how much value you will add to your home. AusStyle roof restoration and roof replacements are very aesthetic and look great for years to come – guaranteed. Approximately one third of what you can see of your home from the street is roof, so installing a new colorbond roof or doing the next best thing and completely restoring it can make a big difference and add a lot of value to your home. Don’t wait until you have water damage in your home to let you know you need a new roof! Call AusStyle Roofing for an obligation free quote and our estimator will advise you of your best options when it comes to your roof. This is really a question of what look you are after and your budget. Colorbond has zincalume steel as its base and is then painted with multi-layer, patented methods that have been tried and tested in Australian conditions. Zincalume is a fantastic product but Colorbond is far superior in terms of its durability and look. It comes in a variety of 20 different colours, from almost white to black. Zincalume has that silver steel roof colour that many people like and it is slightly cheaper, which is why it is used more commonly on commercial buildings with large roofs. Which is better a tiled roof or a Colorbond roof? Each has advantages and disadvantages and it boils down to individual choice, once all the product specifications have been evaluated by both the customer and roofing contractor. Colorbond roofing weighs less than tiles, so it is a good option for an old roof where the roof or building structure has begun to sag, crack or twist under the weight of the old tiled roof. A Colorbond roof will also tend to tie the whole roof together making it stronger. Colorbond roofing is a more versatile product, which can be used on any pitch and used in all roofing designs from the simple A-frame roof to a complex architecturally designed roof. It easily contains and directs the flow of water off the roof regardless of pitch. Tiled roofs are more susceptible to damage than a metal roof by hail and tree branches as even new tiles can crack and subsequently leak, where as Colorbond sheets may be dented by these and not penetrated leaving the roof watertight. And arguably, a new Colorbond roof modernises any home new or old! Who can install my new Colorbond roof? This is the most important choice the home or property owner needs to make prior to installing a new Colorbond roof. The wrong choice can lead to a voided warranty and an incorrectly installed roof, which will leak, causing all sorts of dramas such as staining internal gyprock, mould and water damage in the roof cavity, just to name a few! A LICENSED ROOF PLUMBER is the only person that should be installing your new roof, not your builder, carpenter or mate!! Many tradesmen/builders think that it’s easy to install a metal roof and will often incorporate it into their work to add profit for themselves. What the home owner doesn’t realise, is that unless the tradesman/builder has a roof plumbing license attached to his trade license, the roofs Colorbond product warranty is null and void. Always check your tradesman’s license and those of who he employs on your behalf! AusStyle Roofing provides obligation free quotes to all customers for both new roofs and roof repairs. Contact us on 0412 481 993 or at jo@ausstyleroofing.com.au for all your roofing needs! These photos below show what can happen if you don’t use a qualified installer! We had to replace the whole roof which had just been installed by an un-qualified tradesman. Unfortunately for the clients, they now have to lodge a claim with the Department of Fair Trading NSW to get their money back. Always check a tradesman’s license number. Congratulations – your new roof is now complete. Now its time to activate your Bluescope Warranty. Start here: https://warranties.bluescopesteel.com.au/site/ and then choose the home/ building owner button. If you are at this page and still at the design stage. Choosing the right product is critical you might want to revisit the What warranties are available? and Before you begin your application pages again. Any questions with processing the warranty please call Jo on 0412 481 993 or email.